The prioritisation of green spaces in regeneration schemes can seem at odds with delivery of housing and growth targets, yet renewal and development can be an opportunity to “create places with more nature afterwards than before” – Berkeley Group. Across London, a growing number of developments view green infrastructure (GI) as valuable, multi-functional assets, supporting the delivery of quality homes and neighbourhoods. At FoL’s London Housing Network event in May, we heard from practitioners working to integrate GI within housing developments. Peter Massini, Lead Green Infrastructure – Greater London Authority; Kate Batchelor, Senior Regeneration Manager, Thamesmead – Peabody; Mathew Frith, Director of Conservation – London Wildlife Trust and Louise Clarke, Group Sustainability Manager – Berkeley Group shared their experiences. The intrinsic and recreational value of green space is well known. London is the greenest capital in Europe, and the third greenest city of its size in the world. This is largely the legacy of Victorian philanthropists who worked to share the benefits of parks with the masses. They understood that green space boosts health and stimulates the senses, but we know now the need for green space is more complex. The term “green infrastructure” emerged in the 1980s, around the time that ecosystem services emerged as a model to think about nature in terms of the benefits or “services” provided. The London Infrastructure Plan 2050 observes that although a green city, London’s natural assets are “underutilised and underfunded because [they are] not properly understood in terms of the functions and benefits”. In the same way that man-made networks provide us with services such as water, electricity and transport; ecosystems provide us with essential services. They regulate air quality and climate, produce oxygen, form soils, and prevent flooding. To maintain and enhance these critical functions, Peter Massini (GLA) set out a need to view green space as “infrastructure rather than ornament”. This doesn’t mean doing away with green space’s amenity value: one the GI’s greatest strengths is its multifunctionality. 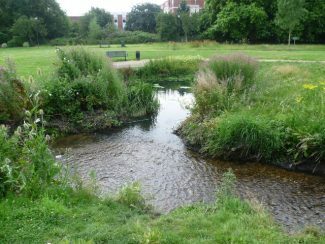 At Lewisham’s Ladywell Fields, a restoration project to liberate River Ravensbourne from a concrete tunnel produced a near 100% increase in biodiversity and simultaneously doubled the number of people using the park. Rather than directing water away through man-made channels, the project increased the park’s ability to safely store flood water during rainy spells. This had the duel benefits of creating more habitats for wildlife and an enjoyable, safe environment for local people. Traditionally, biodiversity and development goals were often viewed as mutually exclusive, but this is changing. Urban living is now the global norm, and cities, in particular, are in need of GI for resilience. London Wildlife Trust’s (LWT) Mathew Frith, sees a role for the organisation in placemaking, working with agents of change. In 2004, LWT instigated conversations with LB Hackney, recognising that LWT plans to improve and enhance Woodberry Wetlands could have greater impact as part of the area’s wider regeneration strategy. LB Hackney’s partner, Berkeley Group, began working with LWT, ensuring nearby housing development Woodberry Down was designed to enhance and safeguard GI. Works to enhance the reservoir brought in local volunteers in numbers far exceeding initial expectations, creating a strong sense of local ownership. Opened by Sir David Attenborough in 2016, the wetlands remain free to use and managed with the help of volunteers. Berkeley Group is making strong moves to integrate GI with housing provision across all sites. In 2017, the developer committed to a net increase in biodiversity in every new development. Ambitious plans for Kidbrooke Village (formerly the Ferrier Estate) see a 50% increase in GI and housing numbers simultaneously. To achieve this balance, strategic planning was required from the earliest stage, using their Nine Concepts model. 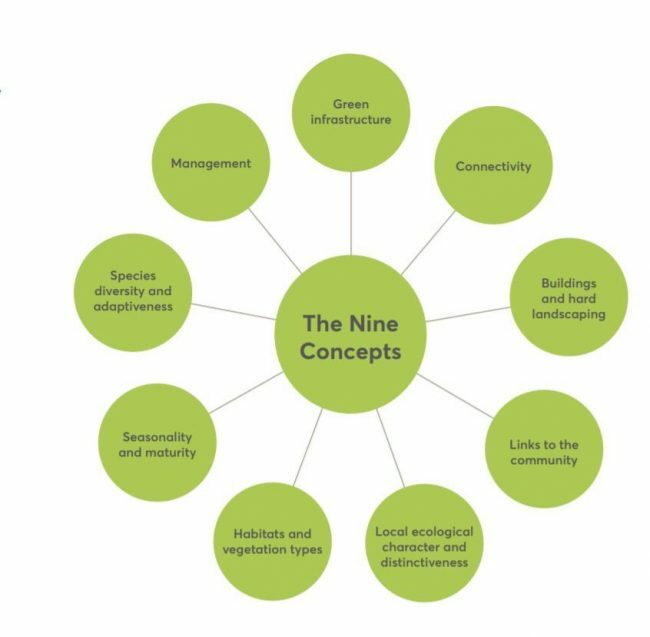 The model is a design guide which seeks to integrate people, biodiversity and the built form, facilitating the net biodiversity increase. The model provides principles rather than prescription, at Kidbrooke Village particular use was made of green roofs, swales and ponds. At Thamesmead, significant growth is coming. 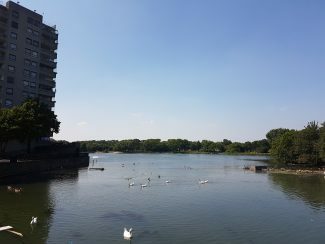 The arrival of Crossrail, 2,500 new homes and a potential DLR extension all hold potential to put stress on the area’s 150ha of green space, six major lakes and three nature reserves. Peabody view the £1 billion regeneration programme as an opportunity to grow the area’s natural assets, building a healthy, green baseline ahead of a 54,000 population increase over the next 30 years. To manage growth while enhancing GI, a dedicated Director of Landscaping and Placemaking has been brought in, making the case for natural capital at the strategic level. Not all developments have the scope for such far-reaching interventions, but even small-scale undertakings can make a big difference. This was the theme of RTPI’s 2017 conference: Small scale, big impact – retrofitting and enhancing green infrastructure. 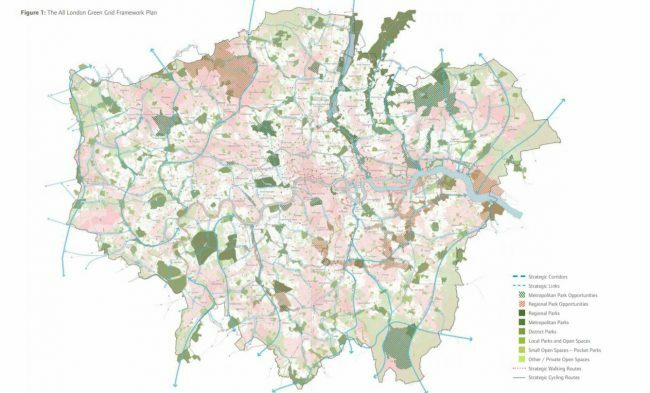 The All London Green Grid SPG observes that “the best way of valuing and managing green infrastructure is to see it as a network spreading across the face of the capital”. It emphasises the importance of urban greening, particularly in the Central Activities Zone. Collectively, the creation of functional “pockets” of green space on and between buildings can mitigate air and noise pollution, cool the city and contribute to the overall connectivity of the network. The All London Green Grid (p.28/9, ALGG SPG, 2012). 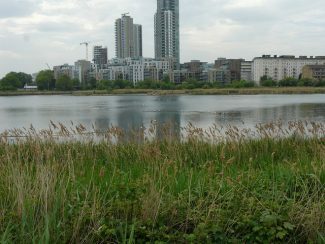 Reflecting on the Woodberry Wetlands project, Gordon Scorer, LWT CEO, observed that “nature, and all its benefits, can be successfully weaved into the fabric of London, and other cities, as they develop and grow”. The idea that delivering housing and GI creates a conflict is outdated, more and more projects are demonstrating what can be achieved what GI and growth are considered together. Enhancing green infrastructure through development and renewal was part of Future of London’s London Housing Network event series, which take place under Chatham House Rules. To get the full picture and join our next lively and candid debate, go to our London Housing Network webpage. London Housing Network supports public-sector organisations in their efforts to meet ambitious and complex housing growth targets. LHN provides technical, policy and political insight, shares best practice and offers a pan-London forum.